Michael Bay put away his giant robot toys for a bit and has moved onto something a little more extreme. Namely, giant, human bodybuilders and their "get rich quick" scams. Pain & Gain, his latest, is at one end the action director's most serious, some would say adult, film to date, taking real-life drama and real-life absurdity and going all in to tell this true story as accurately as a Michael Bay film could be. At the other end, that real-life absurdity makes for some serious hilarity, and Pain & Gain, though it suffers from the lesser-appreciated Bay tropes, ends up being a comedy full of adrenaline and jacked to the gills with laughs. In Pain & Gain, Mark Wahlberg stars as Daniel Lugo, a personal trainer living in Miami who "believes in fitness." We know Lugo believes in fitness, because it's told to us on more than one occasion over the film's somewhat obtrusive but very intriguing voiceover narration. But it's that third time Lugo says this phrase that it clicks. Daniel Lugo believes in fitness in that he believes in results, in putting in your time and effort and getting something on the other end for your troubles. It's the ideal outcome to the American dream, an outcome Lugo doesn't see in effect in his life. In a nutshell, Lugo wants all the riches, nice cars, houses, everything his latest client, Victor Kershaw (Tony Shalhoub), has in droves. Kershaw is an abysmal man, and Lugo, not believing his client deserves the wealth he has, devises a scheme to take it all away from the man. With help from his friend, Adrian (Anthony Mackie), and an religious ex con, Paul (Dwayne Johnson), Lugo goes through with his plan. All goes well until they don't go so well any longer. And it's those "things that don't go so well" that drives the story and comedy in Pain & Gain, keeps the viewer glued for whatever element of lunacy is about to come around the corner, and ultimately tell us what drove Bay to want to tell this story in the first place. The Sun Gym Gang, as they would eventually be called, didn't have much of a plan going in. Their scams were half-baked at best, idiotic scenarios the very real Lugo probably saw in a movie once. That line about him "seeing it in a movie once" feels quite genuine for the character. But being bodybuilders, and decent ones at that, the Sun Gym Gang went into every plan full force, absolutely committed to achieving their goals. It's just a shame those plans weren't planned out. For once in his career, Michael Bay doesn't appear to be shouting over his screenplay with a massive amount of glitzy direction. Pain & Gain rolls hand-in-hand with story and visuals, the reality of the situation giving a bump to the laughs and Bay's incredibly charged vision putting an odd spin to the reality. This latter element to the movie gives it a self-reflexive note, as if the director chose a reality-based story (We aren't counting Pearl Harbor, okay) to finally include a little wink to his audience. Hell, he even throws up a "Yes, this is still based on a true story" card late in the game just to make sure we're all still on board. But Bay doesn't even have to go through all that trouble. The pacing revs and staggers out a little too often, something that leaves the final couple of scenes feel like afterthoughts. Also there's still that disconnect from genuine action/reaction that comes from Michael Bay trying to craft comedy, much broader than it should be for a story that eventually finds its way to being full-fledged, dark material. It usually involves actors YELLING THEIR DIALOGUE EXTREMELY LOUD. Even that plays better in Pain & Gain than in previous Bay efforts. It's all about commitment to Bay's vision. Wahlberg, Johnson, even Shalhoub (especially Tony Shalhoub, now that I think about it) are all absolutely committed here, tossing subtlety into the ocean and going full-bore until the story is told. Mackie holds back a tinge, but it's a matter of going to 10.5 instead of 11. 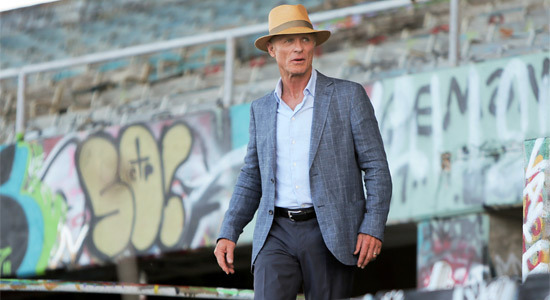 Ed Harris seems to be the only one trying to create any nuance, playing a retired private investigator helping Kershaw retrieve his stolen property. Harris' character seems to fit on a nice ranch in Montana better than the orange beaches of Miami, anyway, so this irregularity between performances fit. He's the only character in Pain & Gain (the only main character, that is) that doesn't let his own darknesses mess up the life he has going. We're supposed to admire him, and we do. Harris in the part gives it all the more help. The other characters in Pain & Gain are dark, dirty, destructive people who found themselves at varying points on the ladder of success. The real events that make up the story don't have a lot to tell us about how to achieve the American dream. You know, other than telling us not to be muscleheads. The real morale with Pain & Gain is to always have a plan, and if you don't have a plan, at least make sure someone with as gaudy an eye as Michael Bay will be telling it. That way, no matter how ridiculous it all is, it'll go down much easier. The comedy, the entertainment in Pain & Gain, whether brightly lit or darker than anything Bay has put to film yet, works with absolutely ease. At that, Bay has never faltered. It's got 48% rotten on the Tomatometer and 41 at metacritic but I think I will like it. Going to check it out anyways because Bad Boys 1 and 2 got crap reviews but I loved those movies. I just got back and absolutely loved it! Dwayne stole the whole show. Have to see this one! this one was good. The Rock really did steal the show and was hilarious. now, having said that: MB still blows and I fully expect him to ruin my childhood with Ninja Turtles. Michael Bay needs to make more of these and stop ruining Transformers.